Microfluidic particle sorting has applications in diagnostics, chemical and biological analyses, food and chemical processing as well as environmental assessment. 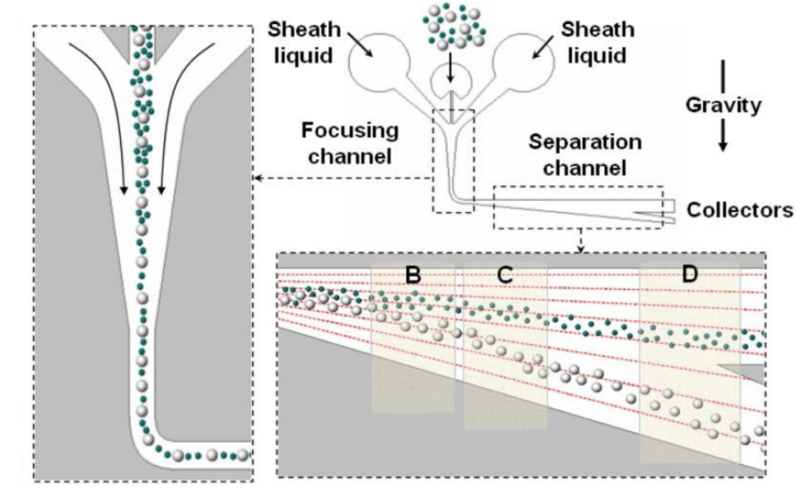 In a previous blog I talked about microfluidics particle sorting using hydrodynamics. Building on the same topic, I will discuss another method of micro particle sorting using gravity, which you can see in the animation below. Ubiquitous gravity can be used for sorting micro particles in microfluidic devices. When gravity acts perpendicular to the motion of the particles, the particles settle down at a velocity dependent on their radius. Additionally, the motion of the particles is influenced by the hydrodynamic effects originating from the difference between the density of the particles, the density of the fluid and the viscosity of the fluid. The image below shows the gravity sorting technique schematic. As mentioned earlier, gravity forces different particles to sediment at different velocities. If all the particles have the same density, and the particle density is less than the density of the surrounding fluid, we can have two types of sorting – buoyancy dominant and drag dominant. The particles with larger radii experience more buoyancy and tend to follow a path above the smaller particles. However, if the inlet velocity of the sheath liquid (solution to carry particles) is high enough, drag effects start dominating and the larger particles tend to move below the path of the smaller particles. 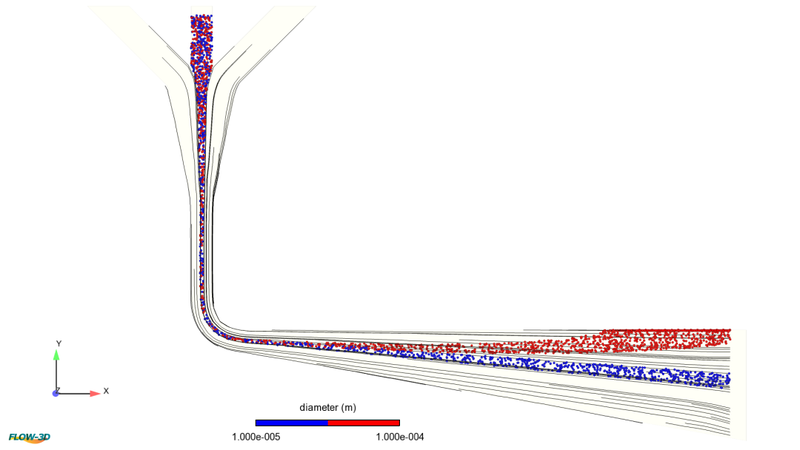 Competing buoyancy and drag forces can be clearly seen in the simulation results obtained below from FLOW-3D. Figure 1 shows a case of buoyancy dominant particle sorting. The larger (red) particles sort out towards the top of the horizontal channel. The results shown in Fig. 2 were obtained after setting the inlet sheath velocity at 20 times that of buoyancy dominant case. At higher inlet velocities, the larger particles carry more momentum and, therefore, their position is not influenced by the vertical buoyant force. Hence, the particles do not rise to the top of the horizontal channel; instead, they continue to move towards the bottom. FLOW-3D’s particle model can be successfully and easily used for microfluidic simulations involving particle sorting, or any other particle dynamics. So far we have seen two particle sorting techniques – one using hydrodynamics and the other using gravity – using FLOW-3D’s particle model. Please free to contact me with your ideas for microfluidics particle sorting simulations or any comments pertaining to this blog at adwaith@flow3d.com.